Conservative and liberal political impulses have contended throughout the history of the U.S. although there are no major Conservative or Liberal parties in the U.S. Instead, the terms signify general inclinations and prejudices encountered to some degree within all major political parties.In terms of contemporary politics, it is reasonably clear that liberalism and conservatism are meaningful terms. But the dichotomy is subject to much confusion when projected against a wider historical background. 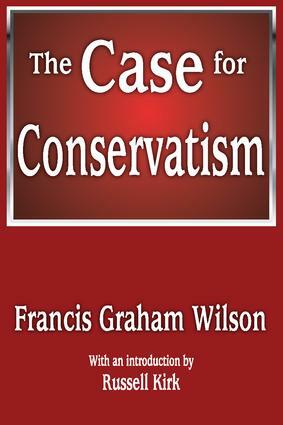 Francis Wilson's lectures on conservatism represent a genuinely philosophical approach. He generalizes upon the content of conservative thought without reducing the result to a mere psychological bent or disposition.Francis Wilson's volume was an expression of intellectual renewal of conservative ideas in the post-World War Two period. Initially published in 1951, it gave expression to the body of common belief that then and now constitutes the essence of conservatism. Lucid and temperate, he outlines the principles to which conservatives subscribe and how they have changed. Published in the Library of Conservative Thought series, The Case for Conservatism has continuing relevance to those who seek to understand the intellectual roots of the contemporary revival of conservative public policies.